A Varlhona dark chocolate cake with Varlhona-Ghiradelli semi-sweet chocolate mousse and blueberry curd with a vanilla meringue center, coated with a Varlhona dark chocolate ganache glaze. Upon knowing that the theme of Aspiring Bakers this month is Layered Cakes, I’ve been dreaming about what kind of layered cake I should make… And one day I saw dear Sibella’s dream cake – I was so hooked with the idea of creating a dream cake! What makes it perfect is that my best friend’s birthday was coming up, so I knew it would be the perfect opportunity to bake her her dream cake. Instead of making it a three layered chocolate cake with mousse and blueberries in between, I chose to add a meringue layer in between, thinking that it would add some texture to the cake. I changed the blueberry jam to a curd because I wanted to try making one. The recipe below is intended for an 8-inch cake, but I made mine a 7-inch and 2 3-inch mini cakes. Overall it’s a very, very heavy cake – in terms of weight and taste. Unfortunately I can’t taste the difference in texture because the meringue integrated with the curd. I think it’s probably because the meringue is too thin. I should have piped a thicker meringue! I used dark chocolate for the border of one of the mini cakes and white chocolate for the big one. I didn’t make the border for the other mini cake because I was lazy… hehe. The cake is very rich and ultimately chocolatey – maybe a bit too rich in my honest opinion. If I ever make this again, I would swap the cake with a chocolate genoise instead. Luckily the birthday girl is an ultimate chocolate girl and she ate it without complains but praise. Her dream cake – the white chocolate border created a very pretty contrast. Chocolate cake – can be made 2 – 3 days in advance; store in an air-tight container at room temperature. Meringue – can be made one day in advance; store it in an air tight container at room temperature. Blueberry curd and simple boozy syrup – can be made one week in advance; store it in the refrigerator. Day 1: Make the cake (store in an airtight container) and simple syrup (store in refrigerator). Day 2: Make the meringue (store in a dry place) and the blueberry curd (store in refrigerator). Day 3: Make the chocolate mousse, assemble the cake and freeze. Day 4: Spread chocolate ganache and make the chocolate border. Thaw in the refrigerator. Day 1: Make the cake (store in an airtight container), simple syrup (store in refrigerator), meringue (store in a dry place) and the blueberry curd (store in refrigerator). Day 2: Make the chocolate mousse, assemble the cake and freeze. Day 3: Spread chocolate ganache and make the chocolate border. Thaw in the refrigerator. 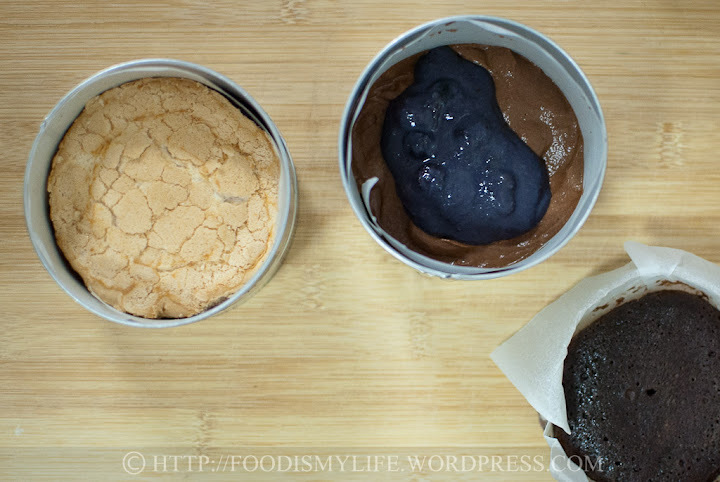 Day 1: Make the cake, meringue, syrup, blueberry curd, chocolate mousse, assemble the cake and freeze. Day 2: Spread chocolate ganache and make the chocolate border. Thaw in the refrigerator. Day 1: Make the cake, meringue, syrup, blueberry curd, chocolate mousse, assemble the cake and freeze for 2-4 hours, spread chocolate ganache and make the chocolate border. Keep in the refrigerator. My plan was in between a busy and crazy one. I made the blueberry curd the night before and then bake and assemble them all the next day (I took about 6h, including measuring, mixing, baking, and assembling. I tried to wash most of my mixing bowls while the cake/meringue is baking). The assembled cake was then frozen for 3 days before I unmould and frost it. It was served the next day. There are a lot of steps, so it is advisable to read the recipes in advance to know the steps involved roughly and prepare all the ingredients a few days before you need them – you wouldn’t want to be out rushing to buy some ingredients while baking something! Most importantly, relax and enjoy the baking process! Peel the lemon zest and juice the lemons. Place the zest, juice, blueberries, water and sugar in a pot over low heat. Stir the berries constantly until the berries have softened and are releasing juices, about 10 minutes. Strain the blueberries into a clean pot to remove the lemon zest and blueberry skins (I did not strain mine, but simply remove the lemon zest). Add in the butter and stir until all the butter has melted. Stir in the eggs gradually. Cook the blueberry mixture over low heat, stirring constantly until it is thick enough to coat the back of a spoon, which will take about 10 to 15 minutes. Transfer the curd into a clean container, let cool completely, cover and refrigerate overnight to let it set. Place the sugar and water in a small pot. Bring the mixture to a boil, swirling the pot to dissolve the sugar crystals. Boil for 2 - 3 minutes on high heat then remove the pot from heat. Let cool to room temperature and stir in the rum if using. Preheat the oven to 170 degrees Celsius. Grease an 8-inch round tin and line the bottom with greaseproof paper. Measure the dark chocolate and unsalted butter in a large heatproof bowl and melt them over a pot of simmering water, stirring occasionally -Note . Remove the heatproof bowl from the pot. Add in the caster sugar and whisk gently – not all of the sugar will dissolve, it’s ok if the mixture is grainy. Let the mixture stand for 10 minutes to cool down slightly (the eggs will scramble if added to a hot mixture). Sift a third of flour mixture into the chocolate batter and folding gently using a large metal spoon or rubber spatula. until all the dry ingredients have been incorporated – Note . Transfer the cake batter into the lined cake tin. Bake for 30 to 40 minutes until a skewer inserted into the centre of the cake comes out clean. Cool the cake in the tin for 10 to 15 minutes, then turn it out onto a wire rack and let it cool completely. Preheat the oven to 120 degrees Celsius. Trace a 7-inch circle onto a greaseproof paper. Place the pencil side down onto a baking sheet. Butter the top of the greaseproof paper lightly. Set aside. Place the egg whites in a clean, dry and oil-free bowl. Use an electric mixer and whip the egg whites on medium speed until frothy, about 2 minutes. Turn up the speed to medium-high and add in the caster sugar, a tablespoon at a time, until the meringue is creamy, about 4-5 minutes. Beat in the vanilla extract on medium speed. Pipe or spread a 7-inch circle on the greaseproof paper, using the template drawn earlier as a guideline. Bake for 55 minutes - 1 hour until the meringue is biege in colour - the meringue will spread out slightly and it will be dry and crunchy on the outside but chewy on the inside. Open the oven door ajar and let the meringue cool completely. The mousse should be made just before assembling the cake so that it will be soft and liquid-y enough to pour it into the mould. Level the cake so that the top is flat. Slice the cake into two horizontally. Set an 8-inch ring mould onto a board. Moisten both sides of one cake slice and place it in the ring mould. Pour half of the mousse onto the cake layer. Spread the mousse all over the cake evenly with a spatula or a spoon. Pour in half of the blueberry curd and spread it evenly. Place the vanilla meringue onto the blueberry curd and press down gently. Pour the remaining mousse over, followed by the blueberry curd. Moisten both sides of the remaining cake slice and place it on top of the blueberry curd, pressing it down gently. Wrap the cake with plastic wrap and freeze it overnight or up to 1 week. Heat the cream in a pot until small bubbles start to appear on the sides (simmering stage). Pour the cream over the chopped chocolate and let it sit for 2 minutes. Stir until all the chocolate has melted. Stir in the golden syrup. Let it sit aside to cool for 30 minutes. Alternatively, heat the cream in a microwave for 30 seconds on medium high. Add in the chocolate and microwave at 15 seconds interval, checking the mixture and stirring it at each interval until all the chocolate has melted. Stir in the golden syrup and let cool for 30 minutes. Remove the cake from the freezer and unmould the cake. Place the cake on a wire rack set over a baking sheet. Pour the chocolate ganache all over the cake, spreading it out with a spatula, letting the excess drip onto the baking sheet. Refrigerate the cake while you prepare the final assembly. Wipe a large table with damp cloth. Immediately line a big piece of plastic wrap on the damp table so that it will stick to the table. This is to help with the ease of clean up later. Measure the height and length of the cake border desired using a long piece of baking parchment and cut it out, leaving an inch on the sides and the top for easy handling later on. Place it on the plastic wrap and hold it down with some paper weights if your baking parchment tend to roll up. Melt the chocolate. Transfer the melted chocolate into a small piping bag. Snip of a small corner of the end of the piping bag. Pipe rounds all over the baking parchment - it doesn't have to be very neat and precise and perfect ovals - it's called being artistic! :p Once the cake border goes up onto the cake, nobody will notice the flaws you think you've made because it will already look grand and beautiful! Leave the piped chocolate aside for 5-10 minutes until it's slightly set but not yet harden - the piped chocolate will not ooze when lifted and when you touched it there will be no trace of melted chocolate on your finger. I wouldn't recommend putting the baking parchment in the refrigerator because the chocolate may harden faster than you think and you will need to start over. Take the cake out of the fridge. Lift up the baking parchment of piped chocolate and wrap it carefully around the cake. Refrigerate until the chocolate has fully set and hardened. Discard the plastic wrap. Peel off the baking parchment as gingerly as you can. If you leave the cake slightly longer at room temperature, the chocolate border will softened as curl downwards. I didn't expect for this to happen but nature took its course and I find that the cake looks great all the same. For the leftover melted chocolate, piped wordings or small pearls at the bottom of the cake for a decorative finish. Keep the cake in the refrigerator overnight to let it thaw out completely. Serve in thin wedges dusted with icing sugar. Substitute the semi-sweet chocolate with dark chocolate or use a mixture of semi-sweet and dark. I used semi-sweet from Ghiradelli and dark from Varlhona. Method 1: Rinse a cloth in warm water. Wipe the sides of the cake pan – you want the sides of the cake to warm up and soften so it’s easier to take it out. Method 2: Place the cake on a cake decorating turn table / lazy Susan. Turn the hair dryer on high heat and use it to warm the sides of the cake to loosen it. I personally prefer this method as it’s faster and more efficient. Hi, thank you Katie! I still have a lot to learn in photography 🙂 I shoot my photos mainly in Aperture or Manual mode using the Nikon 35mm f/1.8 DX lens. Hi!! I’ve baked it last weekend. But there’s still areas to improve!! Your advices are really helpful! Thank you so much!! I really like your photos of the cake! Your pictures are so bright and focused. I have a d3000 too! Which mode did you use to take these pictures!! Hi there! I’m glad I found another fellow foodie! Thank you for the compliments. As for your question, I did not freeze the cake after the chocolate ganache, I froze the cake after the first assembly – where the cake, mousse and curd comes together. The chocolate ganache was applied after I unmould the cake, which I then stored the cake in the refrigerator overnight to let it thaw. Freezing the cake overnight helps the filling inside to firm up, which makes it easier to unmould later on. (It’s easier to unmould a frozen block of cake then soft layers of cake and mousses.) Also, the cake can also be kept longer frozen – I kept mine frozen for about 4-5 days before I unmould it and spread it with ganache. If using ramekins, I will recommend lining the bottom of the ramekins with greaseproof paper, then assemble the cake. Freeze the cake until firm (ramekin cakes are smaller, so they’ll probably need to be frozen for only a couple of hours). Run a small, thin, dry and hot knife (dip the knife in hot water and wipe it dry with paper towels) along the sides of the cake so that it will not stick to ramekin, then turn the ramekin upside down and hold your hand or a plate underneath to catch the cake. A ring mould / cake ring will still be the best option because it has no bottom, so you can assemble the cake directly on the cake board and then unmould it. If you are interested in getting one, I got mine from Phoon Huat (7-inch in diameter and 3-inch in height) and I think it’s not very expensive. Thank you Sandra! I am glad you like it 🙂 Have a great weekend ahead! I m really motivated to bake by all of the food bloggers! I am also very interested in cooking n baking since young. So I m trying to be like one of you, to set up a site to share my cooks and bakes! This cake looks totally awesome. I plan to bake this cake this week but I have some qns. Why do you have to freeze the cake after you add the chocolate ganache? I plan to bake using my ramekins so how should I mould the cakes? Put in the ramekin? 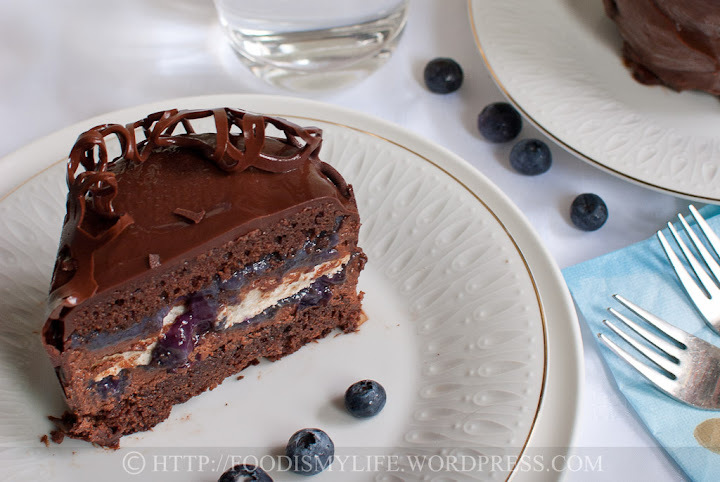 This is beautiful and I love the combination of flavors, chocolate and blueberries together. I love all the layers in this cake! What a delicious combination. how i wish i can have a slice now! i must applaud you for giving such detail explanation of making this cake, i’m sure worth all your busy and crazy plans to get this done! very nice choc borders! Thank you so much for the compliments 🙂 The cake takes time to make but the individual components are not very difficult thankfully 😉 I can’t wait to see your Quadruple Chocolate Cheesecake… just its name is making me drool!! Thank you Bobbi! Took me about a whole afternoon and slightly more since I made most of the components on the same day… it was well worth the effort! Thank you very much Balvinder! I’m glad you enjoyed the slice. Have a great week ahead! A truly wondrous creation. Anything that needs a sketch to create (ok, I used one the first time I made my spinach and cheese lasagna) is a bit out of the ordinary. Wow complicated but I think its all worth the effort just look at that decadent slice. Holy cow. This cake is a thing of beauty. How many hours total did it take you to make? This looks gorgeous. I love every detail of it. Pretty picture of a chocolate cake slice brought me here from Choc chip Uru’s blog. Thank you so much for the compliments Joyce! Practice makes perfect! I still have much more to learn 😉 Glad you enjoyed the cake! I’m glad you enjoyed the cake! There’re really too many steps… I think I’ll make this kind of cake only a couple of times a year, the amount of washing is just so scary haha. It’s a beautiful cake! You really have the patience to make the cake with all the lengthy steps! Kudos to you! I am lousy when it comes to layer cakes! I’m awed by your creativity! Super great job, Jasline! It doesn’t sound weird, it sounds delicious! Thank you for sharing this recipe! It’s a gorgeous looking cake but well worth all the effort. Thank you Yvette! I have to agree with you, the relax mode is an ideal situation that’s very hard to achieve! I’m happy that you like this post, thank you! Thank you so much for the compliments! I definitely won’t mind if you reblog this – I am so happy that you like this cake. Thank you! Thank you, thank you Sam! I hope the detailed instructions will help anyone out there who’s interested in baking this cake 😉 If not for you choosing Layered Cakes as the theme of Aspiring Bakers this month, I may not have baked this cake, thank you! Thank you Villy! Have a great weekend ahead! Thank you Catalina! At first I think it sounds weird, blueberries and chocolate together in a cake, but I’m glad the flavours worked out nicely. Thank you so much, it’s really time consuming, but the results are very rewarding. Thanks for stopping by, take care! I would hope I could make this cake in the ‘relax’ mode, but know would probably be in the ‘crazy’ zone!LOL! Wonderful details and like the draft up drawing as well. A great post! this looks… really good.. I mean… REALLY REALLY GOOD!!! Instructions are so detailed and looks like there are quite a few components of the cake. I would have been afraid to flip the meringue layer! Looks so fragile. hehe.. I like how you sketched the cake out! That’s a great idea. Plus, I love the chocolate “frills” on the top. Great job and thanks for your submission!! Wow… This is a spectacular and intricately assembled birthday cake! Good on you, it must have taken some time to prepare! Lucky birthday girl!!! This is one unbelievable cake! A real thing of beauty. I love this! Great idea and execution of course! Looks just gorgeous! Blueberry curd – yum. 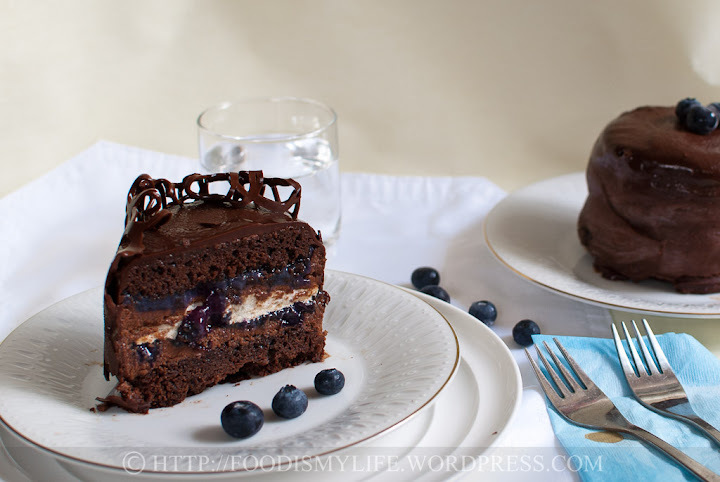 Wow Jasline thi scake is beautiful, the blueberry curd sounds amazing in this chocolate cake!!! Very nice!!!! 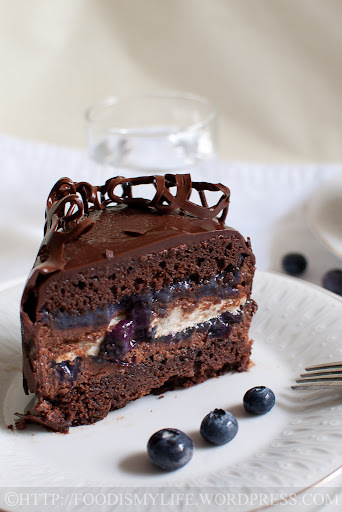 What a spectacular cake, I love the blueberry curd what a wonderful addition to the rich chocolate cake. Truly a work of art.